2016 was a busy year for the OTW’s Finance team, and we’re hard at work improving the organization’s bookkeeping and financial policies. Budgeting is another area where we’ve improved in the past few months—especially with regards to collaborating with our various teams to project their likely expenses and accounting for unexpected changes. US$7,013.49 spent so far out of US$213,339 total this year, as of February 28, 2017. 75.7% of the OTW’s expenses go towards maintaining the AO3. This includes the bulk of our server expenses—both new purchases and ongoing colocation and maintenance—website performance monitoring tools and various systems-related licences (access all program expenses). Starting last year, we’ve conducted a search for companies that could work with us on upgrades to AO3’s infrastructure. We’ve collaborated with two companies so far on preparing for our much-needed Rails upgrade, and look forward to expanding our contracting projects this year. US$312.61 spent so far out of US$7,487.50 total this year, as of February 28, 2017. Fanlore expenses are mostly its allocation of server purchase, maintenance and colocation costs, in addition to related licenses and Fanlore web domains (access all program expenses). US$400.04 spent so far out of US$4,383 total this year, as of February 28, 2017. Transformative Works and Cultures’ expenses are its allotment of server costs, as well as the journal’s publishing and storage fees (access all program expenses). US$60.80 spent so far out of US$1,536.47 total this year, as of February 28, 2017. This year’s expenses for Open Doors are hosting, backup and domain costs for archives imported by Open Doors (access all program expenses). US$0 spent so far out of US$3,500 total this year. Legal’s expenses consist of filing fees and travel expenses for conferences (access all program expenses). US$0 spent so far out of US$5,000 total this year, as of February 28, 2017. Our convention outreach expenses consist of preparing and shipping promotional material related to the OTW and its projects for volunteers to share with other fans at conventions, as well as potentially organizing spaces of our own during conventions (access all con outreach expenses). US$1,573.52 spent so far out of US$23,060 total this year, as of February 28, 2017. Our fundraising expenses consist of transaction fees charged by our third-party payment processors for each donation; thank-you gifts purchase and shipping; and the tools used to host the OTW’s membership database and track communications with donors and potential donors (access all fundraising expenses). US$977.15 spent so far out of US$23,660.83 total this year, as of February 28, 2017. The OTW’s administrative expenses include hosting for our website, trademarks, domains, insurance, tax filing, as well as project management, communication and accounting tools (access all admin expenses). We receive most of our donations each year in the April and October fundraising drives, which together should account for about 75% of our income in 2017. We also receive donations via employer matching programs and Amazon Smile. The OTW Finance team is investigating options for a sustainable plan to invest the OTW’s current reserves; our forecasted income should be enough to cover this year’s expenses without requiring emergency withdrawals from our reserves. US$6,839.56 so far (as of February 28, 2017) and US$308,500 projected until the end of the year. If you have any questions about the budget or the OTW’s finances, please contact the Finance committee. We will also be hosting an open chat to answer any questions you may have. This chat will take place in our public chatroom on April 9 from 5 to 7PM UTC (what time is that in my timezone?). This post will be updated with a chatroom link a few hours before the appointed time. Come chat with us, and bring your questions! 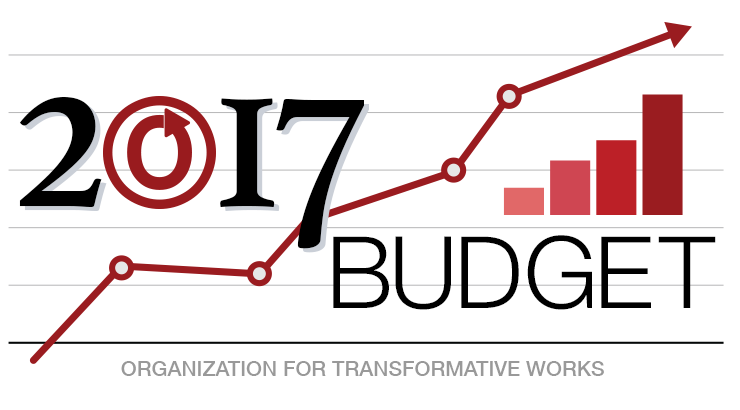 To download the OTW’s updated budget for 2017 in spreadsheet format, please follow this link. Great overview. Very informative and easy to read. Thank you for posting it!